I consider myself a strong cyclist, but, despite my best efforts, the trio of Canadian cyclists who have volunteered to show me the highlights of road biking in the Canadian Selkirks are casually lapping me. The tiny alpine community of Rossland is one of the highest-elevation towns in Canada, and, although it’s better known for world-class mountain biking, its road-cycling aficionados have plenty to celebrate: low-traffic roads, a nice mix of mellow valley and strenuous mountain roads, and phenomenal scenery in the heart of the Canadian Selkirks. My Canadian hosts were too polite to point it out, but the same terrain that breeds fearless freeriders also shapes steel-calved climbers. My hosts were also fortunate enough to live and ride on the International Selkirk Loop, which should be on any skinny-tired cyclist’s life-list. The continent’s only international scenic byway, the International Selkirk Loop winds 280 miles through Washington, Idaho and southern British Columbia, showcasing valley-bottom riding past glacier-carved lakes and the lofty peaks of the Selkirks, with a hefty dose of history on the side. From Sandpoint and beyond the international border, the well-signed route traces the upturned-boot shape of the east shore of Kootenay Lake. Cyclists then cross the lake on the world’s longest free ferry before proceeding to the artsy community of Nelson. From there, a quiet highway winds south through the Salmo River valley and across the border to Metaline Falls. Cyclists parallel the north-flowing Pend Oreille River back into Idaho. Six Super Side Trips add another 450 miles of pavement. Despite the abundance of strong cyclists who live and ride along the Selkirk Loop, it’s mostly mellow valley-bottom cycling on the main route. Besides, there’s plenty to keep riders’ minds off saddle-sore legs: Wildlife-watchers can scout for bighorn sheep, mountain goats and birds, and history buffs can tour the many interpretive sites showcasing the region’s pioneer history. All will admire the sky-scraping Selkirks mirrored in the myriad lakes and rivers on the loop. San Diego-based cyclist Creed McPherson has been long-distance touring for 15 years and guiding trips for the Missoula-based Adventure Cycling Association for the last three. McPherson cycled the Selkirk Loop last year – he just didn’t know it when he first clipped into his pedals. “I had some friends who lived on Sacheen Lake with whom I was staying, so I took my bike up into Canada and ran into some people doing the loop,” he said. McPherson kept going. And going. And this year, he’s planning to go back. On the phone at the end of a bike tour through New Zealand, McPherson, who’s led trans-America tours and cycled throughout the world, said the Selkirk Loop stacks up favorably with tours around the globe. “The scenery on the Selkirk Loop, for one thing, quite truly reminds me a lot of New Zealand. Riding along the lakes and rivers is gorgeous,” said McPherson. The fjord-like lakes and fog-enshrouded peaks comprising the Selkirk Loop, more than other places, have been shaped by ancient but restive geological forces: some of the continent’s oldest rock; deep, glacier- and flood-gouged lakes; vast veins of ore; hidden geothermal hot springs. artisans in funky communities from Boswell to Winlaw; Nelson is ranked the No. 1 small arts town in Canada, and signs for various studios line the loop. “When I got to Balfour (on the west side of Kootenay Lake), I took the ferry across to Crawford Bay, and there was a medieval festival going on; I camped right there in the middle of it,” said McPherson, who recommends that cyclists look into the festival schedule for their route to catch Selkirks culture. Pre-planning also mitigates the sometimes long distances between communities in this sparsely populated part of the region; McPherson notes a particular 50-mile stretch on the east shore of Kootenay Lake from Crawford Bay all the way south to Porthill where he had no access to food. McPherson camped and stayed in Airbnbs on his way around the loop; for cyclists looking for cushier accommodations, he recommends searching Airbnb.com. The International Selkirk Loop has sample five- and 10-day itineraries that break the ride into logical, manageable chunks. But there’s an appeal to an open-ended itinerary, the vast landscape of the Selkirks ideally suited to the pace of 700cm wheels. “You don’t have to ride all day,” said McPherson. 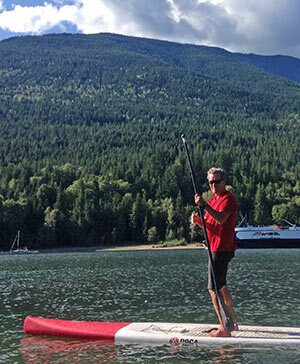 “I recommend getting off the bike for a day and doing something different.” McPherson remembers in particular a sunrise stand-up paddleboarding session on Kootenay Lake and plentiful berry-picking in the Salmo River valley. For cyclists with wider tires, McPherson also recommends checking out some of the primitive side roads throughout the loop. Around Metaline Falls and north into the Salmo River valley, McPherson explored some of the dirt roads paralleling the main route, where he said he felt like he was “the only person for miles.” He was not the only living creature, though, as he discovered when he startled a black bear sharing the same berry-picking bounty as he was. McPherson has been cycling enough that his definition of a “slow pace” may differ from the average cyclist’s, but it seems the Selkirk Loop inspires idling. His must-have piece of gear on his next trip? A fly rod.